Allies in the National Government should work together in overcoming obstacles it faces when delivering what it pledged to deliver, Prime Minister Ranil Wickremesinghe said today. “I thank all those who placed trust on us and on President Maithripala Sirisena on January 8, 2015. We are committed to deliver what we pledged three years ago. The allies of the government should get together in celebrating what we have achieved but to overcome obstacle that lay before us when delivering what we promised to the people,” he said in a special statement. 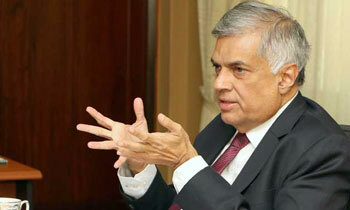 Mr. Wickremesinghe said the government is still committed to bring those who use violence to terrorize the media. “Over nine years have passed since the killing of Sunday Leader Editor Lasantha Wickrematunge and three years since the national government came into power. We pledged to bring those who use violence against media to book and we are still committed to it,” he added. He recalled that editorial which Mr.Wickrematunge wrote stating that he was writing it while knowing that the death is in his doorstep. He recalled how the former regime handled the media. “Lasantha said People will get to know about the nature of the regime when his children lose their father,” the Prime Minister recalled. Mr. Wickremesinghe said there is much to achieve though this government has been able to take the executive from the clutches of one family. “We were battling to release the public servants who had become slaves for just one family and against the suppressing of media using killer squads,” he also said. He said the government has been able to bring in Right to information Act to ensure the people’s right to know vital information while ensuring the rights of victims who have been subjected to crime. “The government has managed to reactivate the 17th Amendment to the Constitution and to maintain the independence of judiciary,” he said. Very Sorry Sir, No Trust . ( No Action Talking Only ) NATO. Recover what the nation lost due to Bond Scam also with allies together. ... and plunder the nation even further. What trust in you? You have betrayed the people. You are asking again to trust you for another bond scam? What a pity people are suffering as never before.